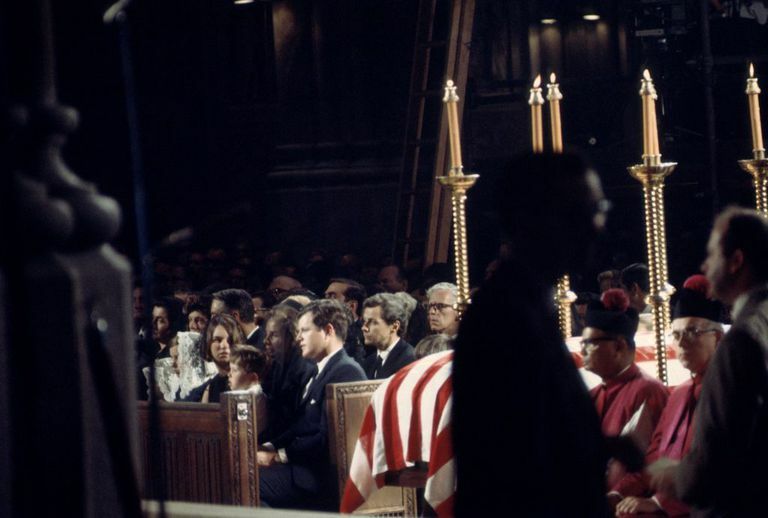 Funeral of Senator Robert F. Kennedy at St. Patrick's Cathedral in New York. Shortly after midnight on June 5, 1968, presidential candidate, Robert F. Kennedy was shot three times after giving a speech at the Ambassador Hotel in Los Angeles, California. Robert Kennedy died of his wounds 26 hours later. Robert Kennedy's assassination later led to Secret Service protection for all future major presidential candidates. On June 4, 1968, popular Democratic Party presidential candidate Robert F. Kennedy waited all day for the election results to come in from the Democratic primary in California. At 11:30 p.m., Kennedy, his wife Ethel, and the rest of his entourage left the Royal Suite of the Ambassador Hotel and headed downstairs to the ballroom, where approximately 1,800 supporters waited for him to give his victory speech. After giving his speech and ending with, "Now on to Chicago, and let's win there!" Kennedy turned and exited the ballroom through a side door that led to a kitchen pantry. Kennedy was using this pantry as a shortcut to reach the Colonial Room, where the press was waiting for him. As Kennedy traveled down this pantry corridor, which was filled with people trying to catch a glimpse of the potential future president, 24-year-old, Palestinian-born Sirhan Sirhan stepped up to Robert Kennedy and opened fire with his .22 pistol. While Sirhan was still firing, bodyguards and others tried to contain the gunman; however, Sirhan managed to fire all eight bullets before being subdued. Six people were hit. Robert Kennedy fell to the floor bleeding. Speechwriter Paul Shrade had been hit in the forehead. Seventeen-year-old Irwin Stroll was hit in the left leg. ABC director William Weisel was hit in the stomach. Reporter Ira Goldstein's hip was shattered. Artist Elizabeth Evans was also grazed on her forehead. However, most of the focus was on Kennedy. As he lay bleeding, Ethel rushed to his side and cradled his head. Busboy Juan Romero brought over some rosary beads and placed them in Kennedy's hand. Kennedy, who had been seriously hurt and looked in pain, whispered, "Is everybody all right?" Dr. Stanley Abo quickly examined Kennedy at the scene and discovered a hole just below his right ear. An ambulance first took Robert Kennedy to the Central Receiving Hospital, which was located just 18 blocks away from the hotel. However, since Kennedy needed brain surgery, he was quickly transferred to Good Samaritan Hospital, arriving around 1 a.m. It was here that doctors discovered two additional bullet wounds, one under his right armpit and another just one-and-a-half inches lower. Kennedy underwent three-hour brain surgery, in which doctors removed bone and metal fragments. Over the next few hours, however, Kennedy's condition continued to worsen. At 1:44 a.m. on June 6, 1968, Robert Kennedy died from his wounds at age 42. The nation was severely shocked at the news of yet another assassination of a major public figure. Robert Kennedy was the third major assassination of the decade, following the murders of Robert's brother, John F. Kennedy, five years earlier and of the great civil rights activist Martin Luther King Jr. just two months earlier. Robert Kennedy was buried near his brother, President John F. Kennedy, in Arlington Cemetery. What Happened to Sirhan Sirhan? Once police arrived at the Ambassador Hotel, Sirhan was escorted to police headquarters and questioned. At the time, his identity was unknown since he was carrying no identifying papers and refused to give his name. It wasn't until Sirhan's brothers saw a picture of him on TV that the connection was made. It turned out that Sirhan Bishara Sirhan was born in Jerusalem in 1944 and emigrated to the U.S. with his parents and siblings when he was 12 years old. Sirhan eventually dropped out of community college and worked a number of odd jobs, including as a groom at the Santa Anita Racetrack. Once the police had identified their captive, they searched his house and found handwritten notebooks. Much of what they found written inside was incoherent, but amidst the rambling, they found "RFK must die" and "My determination to eliminate RFK is becoming more [and] more of an unshakable obsession...[He] must be sacrificed for the cause of the poor exploited people." Sirhan was given a trial, in which he was tried for murder (of Kennedy) and assault with a deadly weapon (for the others that were shot). Although he pleaded not guilty, Sirhan Sirhan was found guilty on all counts and sentenced to death on April 23, 1969. Sirhan was never executed, however, because in 1972 California abolished the death penalty and commuted all death sentences to life in prison. Sirhan Sirhan remains imprisoned in Valley State Prison in Coalinga, California. Just as in the assassinations of John F. Kennedy and Martin Luther King Jr., many people believe there was also a conspiracy involved in the murder of Robert Kennedy. For Robert Kennedy's assassination, there seem to be three main conspiracy theories that are based on inconsistencies found in the evidence against Sirhan Sirhan. Second Shooter—The first conspiracy involves the location of the fatal shot. Los Angeles Coroner Thomas Noguchi conducted the autopsy on Robert Kennedy's body and discovered that not only had Kennedy died from the shot that entered just below and behind his right ear but that there were scorch marks around the entry wound. This meant that the shot must have come from behind Kennedy and that the muzzle of the gun must have been within an inch or so of Kennedy's head when it was fired. By nearly all accounts, Sirhan had been in front of Kennedy and had never gotten closer than several feet. Could there have been a second shooter? The woman in a Polka-Dot Skirt—The second piece of evidence that easily lends itself to conspiracy theories is the multiple witnesses who saw a young woman wearing a polka-dot skirt running from the hotel with another man, exuberantly exclaiming, "We shot Kennedy!" Other witnesses say they saw a man who looked like Sirhan talking to a woman in a polka-dot skirt earlier in the day. The police reports bypassed this evidence, believing that in the chaos that followed the shooting, it was more likely the couple was crying out, "They shot Kennedy!" Hypno-Programming—The third takes a bit more of a stretch of the imagination but is one advocated by Sirhan's lawyers during pleas for parole. This theory claims that Sirhan was " hypno-programmed" (i.e. hypnotized and then told what to do by others). If so, this would explain why Sirhan asserts that he can't remember any of the events from that night. Do You Know How Caesar Was Assassinated? How Was Leon Trotsky Assassinated?